Being a child prodigy means having an enormous talent, one that is simply there, and doesn’t take decades to master. A child prodigy might evoke awe, amazement and wonder – how do they do the things they do? They might even be the source of jealousy, as they can so easily do things that others strive for a lifetime to achieve. These modern child prodigies might make you feel inadequate – but keep in mind that they can also give you hope with the amazing, wonderful things they can do. This pint-size Picasso started painting at the age of two, and her art was featured in galleries – but the curators had no idea she was so young. Today she is compared to Picasso or Pollock, and her artwork is in great demand all over the world by some of the top collectors and museums. Born in 1992, this Florida native became the youngest chess grandmaster at the tender age of 14. He began playing when he was five, and started winning all his tournaments. By the age of 12 he was traveling internationally to compete in tournaments. Today he still plays chess and splits his time between homes in Europe and Florida. Born in 2002, this young girl is the daughter of singer Pavel Stratan. During recording one day, the young girl took the microphone and began to sing, eliciting surprise and astonishment from her mother. Today her recordings have been translated into other languages, she has won several awards and performs in front of live audiences, as she has been doing since the age of three. By the age of 10, this precocious young man was enrolled in college. By the age of 12, he had been nominated for the Nobel Peace Prize for the first time, thanks to his work with International Youth Advocates, which he founded. Now 23, he has been nominated four times for the prize. Born in 1993, this young man was speaking at nine months and reading Shakespeare by the age of five. He learned everything he could about surgeries, and when a young girl needed one but her family couldn’t afford it, Jaswal stepped in and used his skills to help her. The surgery was a success, and since then he has been praised for his medical prowess. Diagnosed with moderate to severe autism when he was two, doctors told his parents he wouldn’t be able to do much. But by the age of three, he could recite the alphabet forward and backward. He enrolled in Indiana University at the age of 10, and is currently working toward a PhD in Physics. Born in Hong Kong, he enrolled in Hong Kong University at the age of nine. His only “B” was in statistics. 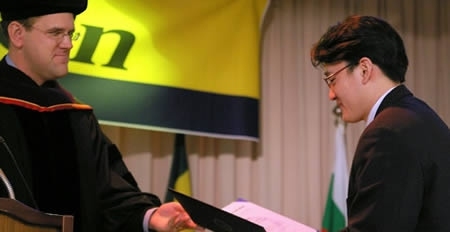 He completed a double-program of a bachelor’s and master’s degree in mathematics, finishing one year sooner than his peers. Today he is pursuing his PhD in Mathematics at a United States university. This child prodigy is so brilliant, it’s almost frightening. He began talking at four months of age and reading when he was only ten months old. At four years he made a perfect score on the test for the Johns Hopkins precocious math program. By the age of six he graduated high school, and by ten he was a college graduate. When he was 17, he started teaching. 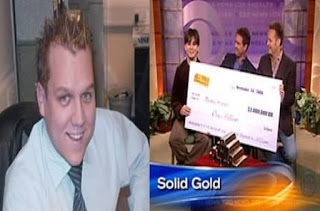 He also won he also won 1 million in ‘Who Wants to be a Millionaire?" He seemed like a normal kid – but he could hear music in a way no one else could. 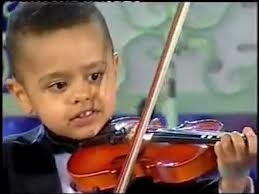 By the age of two he was an accomplished violinist. He debuted at the age of three during a Christmas concert. He is now under the teaching of master violinist Andre Rieu. Who could beat this child prodigy in terms of IQ? Born in 1963, he has an IQ of 210 – to put that in perspective, Einstein’s IQ was a measly 160. At only three he was a guest student of physics at university, and by four he could read four languages. By ten, he was reading eight languages. He earned his PhD in Physics at the age of 15, and since then has earned a doctorate in engineering as well. Today he’s a teacher for some very lucky students.